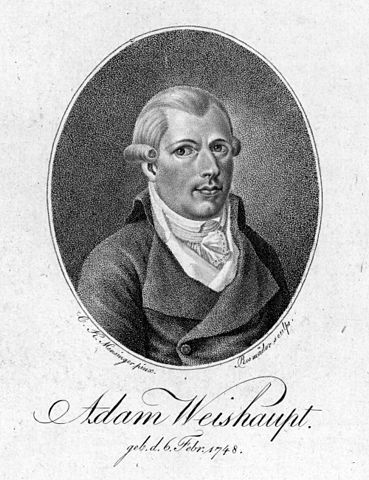 Weishaupt’s humanistic system of Illuminism, and his Order of the Illuminati, emerged from a small group of anti-royalist, anti-clerical students Weishaupt had established at Ingolstadt. After he became a Freemason in 1777, he began to work towards incorporating his system of Illuminism into that of Masonry, with the aim of extending his social ideals throughout the world. For a time, the Illuminati exercised a considerable amount of influence, but ultimately ended in failure; largely due to vehement ecclesiastical persecution coupled with the incompetence of many of Weishaupt’s disciples. He was banished from Bavaria in 1784, and spent the remainder of his life as a guest of the Duke of Gotha, where he wrote A Picture of the Illuminati (1786), A Complete History of the Persecutions of the Illuminati in Bavaria (1786), An Apology for the Illuminati (1786) and An Improved System of the Illuminati (1787). Most of Weishaupt’s biographers, including Barruel and Robison, have been ecclesiastical or royalist partisans, and have therefore vilified and slandered him.